I’m not really smart enough, at least not right now, to say why I like Phil Neel’s covers so much. I want to get all art theory and cultural studies and philosophical on them, but again, the smartness thing. 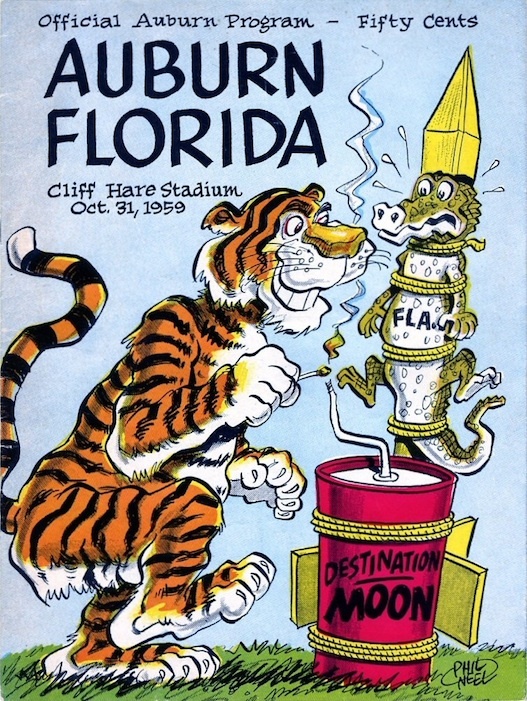 If I was smart enough, I think I’d probably say something about cartoons on football program covers filling me with secondhand nostalgia for a time when cartoons could be on football program covers. You’d drive to Auburn to Grandmama’s house and dig around in the closets and the trunks and the attics and you’d see these old, awesome Auburn comic books that had old Auburn football players in them and this man named Shug that looked just like Granddaddy and you thought, man, this is the way it used to be–Auburn was a Disney movie, the Son of Flubber or something, and the way it used to be was the way it still was once upon a time. Or something. All of this is a dumb way to say that my Auburn wouldn’t be Auburn without Phil Neel. Mr. Neel passed away early this morning. The reason (I guess) that, as of this afternoon, The War Eagle Reader is still the only outlet to have quotes from his family in our reporting of his death is because I interviewed him in 2006—it was like meeting Walt Disney—and I still have his phone number in my contacts. I kept it to feel Auburn. I never felt more Auburn than I did when I would pocket dial Phil Neel. Neel spoke of Aubie, his most famous creation, in terms of detached endearment, as a grandparent quietly proud of a grandchild’s achievements. 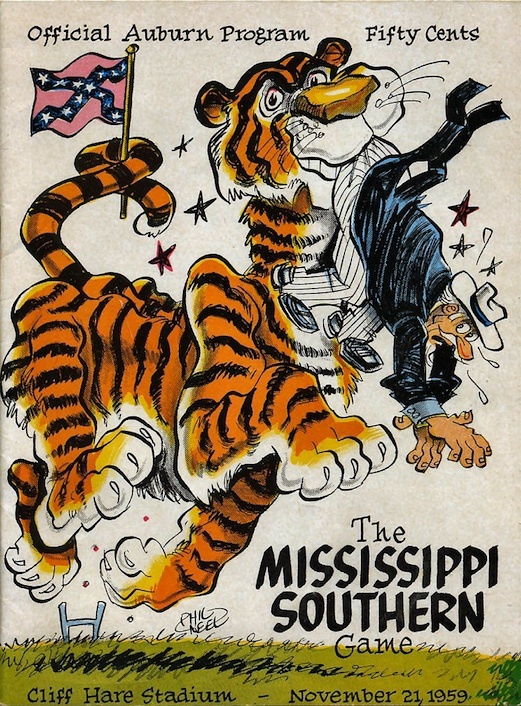 For his part, Neel never really knew the nostalgia-fueled appetite for his work existed until 2006 when former Auburn Athletics Director David Housel approached him with the idea of publishing a collection of his covers. But we do, thanks in large part to one collector in particular that has had more like a field decade, Clyde Kingry. He has sent us scans of his collection. He has done the world a favor. 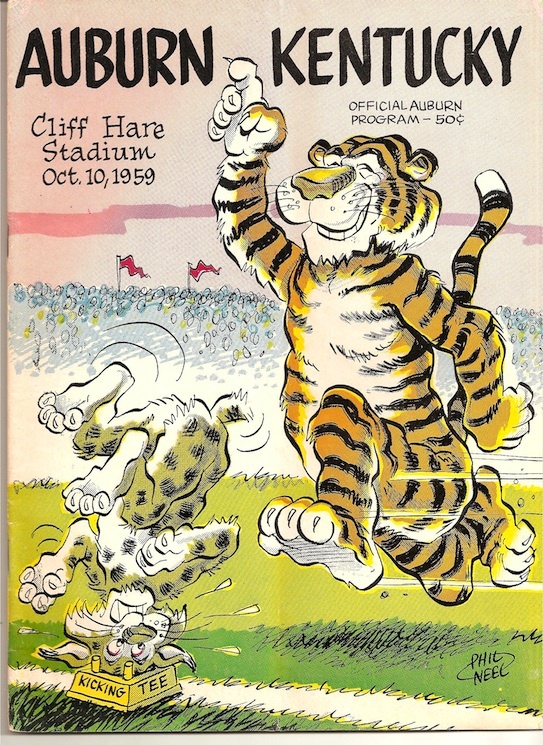 We start with the program for the 1959 Hardin-Simmons game played in Cliff Hare Stadium on Oct. 3, 1959. It was Aubie’s first appearance on an Auburn “Official Program.” And he came out swinging. “It started off like he was going to eat up everybody the first two or three times (he appeared on the program) as a wild tiger, but pretty soon, it was that he would just try to trick people,” Neel said. We’re coming out swinging, too. 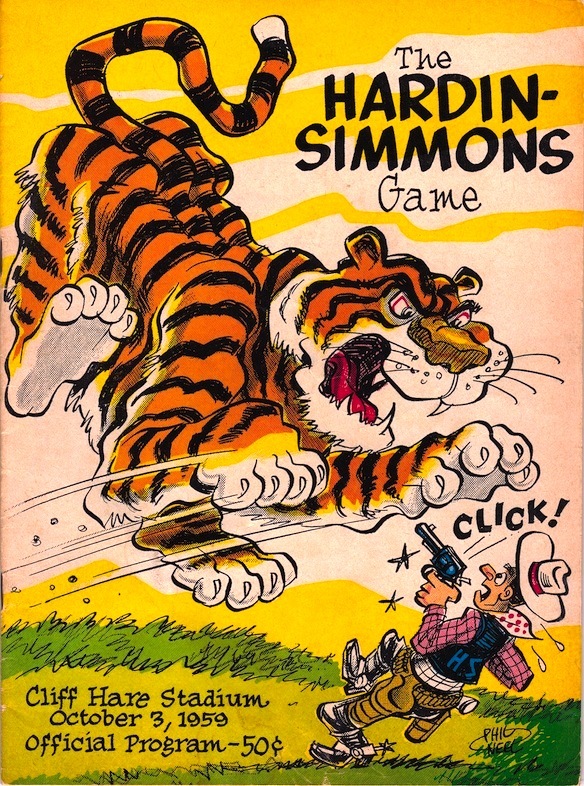 The rest of this first installment are the covers for every Auburn program Aubie appeared on in 1959, which was all of them. We’ve been meaning to start this archive for a long time. Today seems a fitting time to get around to it, to celebrate the work of a great artist and a great man. 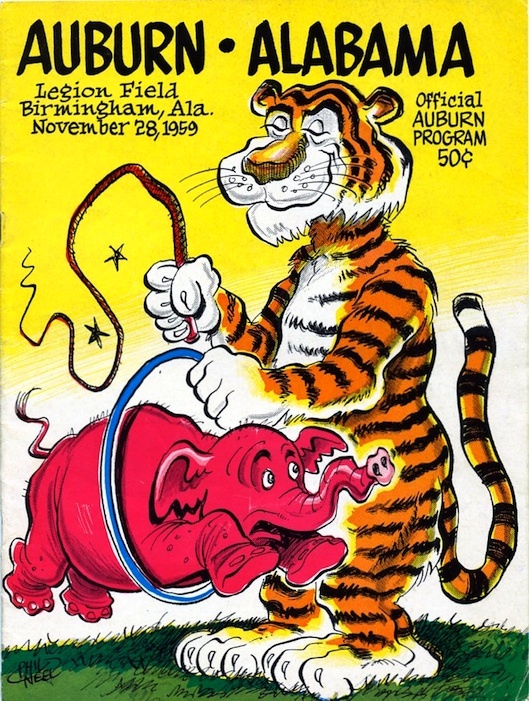 UPDATE: The 1960 Aubie programs. If you’d like to help TWER keep the lights on and the obsession with Auburn lore unhealthy, please click here. I know CK well and you will be a guardian of Mr. Neel’s works for him. Phil Neel created such an AU Icon with Aubie. The perfect mascot, loved by all. enough to experience the sheer fun of those AU programs. War Damn Phil Neel ! place for AU Philospher Chefs. All the best to you and TWER ! Can’t remember exactly when (79-82ish) I bought a pair of Mr. Neel’s charcoal pencil drawings at a mall where he was exhibiting his work in a booth. I bought his eagle print, and his tiger print, and stood there while he color-penciled them in to complete them. I have them in my office to this day! I also remember his Aubie Game Day drawing of Aubie as a forester cutting down “I believe it was) the Wake Forest” players with a chainsaw (circa 1977 more or less)!